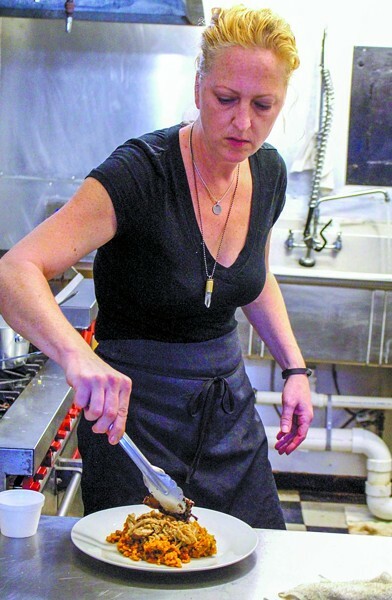 LOX AND bagels from New York City, chicken and rice from Puerto Rico and cheesy grits from the south all have one thing in common: Fork & Dagger Eatery. Fork & Dagger is at 609 ½ Abercorn St. on the ground floor of the Chatham Apartments and across the street from Cuoco Pazzo. The breakfast and lunch joint officially opened its doors March 24, but plans to debut an expanded menu at their grand opening April 22. Brian Torres and Sky Hoyt co-own this family business together. Both Torres and Hoyt have been in Savannah for well over a decade, offering strong influences on the foodie community over the years. 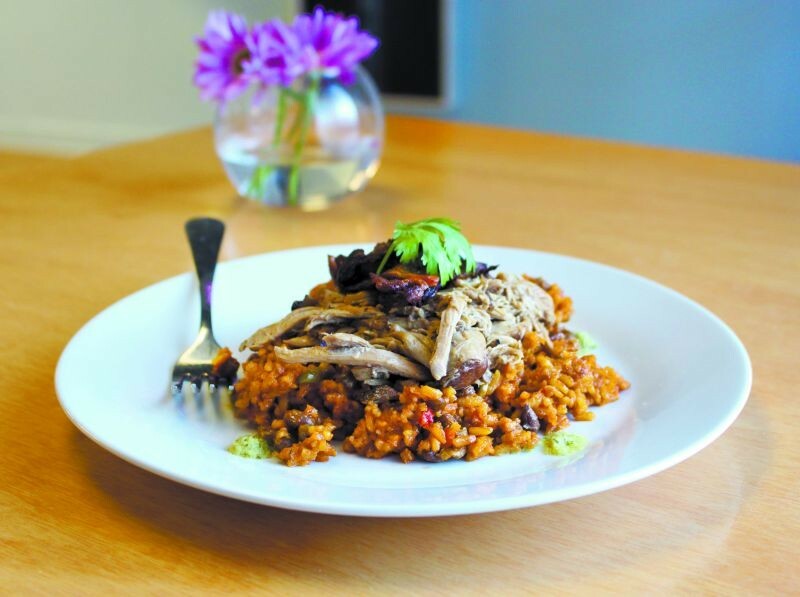 A taste of Puerto Rico with Nana’s Arroz con Pollo (chicken with rice), made with sazon roasted chicken thighs. While they are successful business partners, they also have a personal background with one another. After growing up in north Florida, Hoyt received a political science degree from Armstrong and then moved to Charleston. Torres, on the other hand, lived in New York City for some time and decided to escape the winters by moving south to Charleston. After meeting in this city, the two instantly connected and decided to move to Spain for three years. Given that Torres is a 100 percent Puerto Rican from New York City and Hoyt specializes in Spanish cuisine, patrons can expect these flavors integrated into Fork & Dagger fare. “We put touches of family recipes into everything we do,” Torres explains. Hoyt has been in Savannah for about 20 years and among other things, was the former chef at Foxy Loxy. Since then, she has focused her time and energy on catering. For five years, Torres was the wine director at Sapphire Grill and then became a partner for the restaurant EOS, which was housed in the same space as Cotton and Rye. Torres later established the business FORM, showcasing his famous cheesecakes as well as specialty wines and cheeses, in this exact same location. 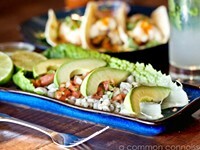 Sky Hoyt is an expert in Spanish cuisine and integrates into the Fork & Dagger fare. In those days, FORM cheesecakes could be found in 25 different locations, including Whole Foods. Torres decided that it was time to “get the accounts back” and he needed a home for the FORM cheesecakes. Thus, Torres and Hoyt joined together and formed (no pun intended) Fork & Dagger, as a way to support both their catering ventures and cheesecake business. “This was meant to be catering space,” Hoyt admits. But with their extensive expertise and experiences in the restaurant industry, the two best friends decided to feature their specialties to the breakfast and lunch crowds of the Victorian District. While the former FORM cheesecakes will now be labeled “Fork & Dagger” cheesecakes, the recipe remains the same. “Brian has been making this recipe since he was a child,” Hoyt explains. They will be offering 50 different flavors, including the ever so popular New York Style as well as white chocolate hazelnut, maple bacon and so much more. The rich and creamy texture of this handmade dessert surpasses expectations, making it some of the best cheesecake in town. Keep an eye out for Fork & Dagger Cheesecake at local stores and restaurants because it’s making a comeback! Upon entry of this quaint eatery, patrons will find a walk up counter, with a glass case full of cheesecake slices, and an open concept kitchen directly behind it. The floor to ceiling windows are halfway frosted, allowing diffused natural light to seep into the space, while offering privacy at the ground level. The space is calming, with baby blue walls and light wood tables and floors. Hoyt handcrafted and designed everything in the space, including the tables and counters. “She is good with power tools,” Torres brags about his partner. Local art is hung on the wall and florescent lights are covered with fabric, contributing to the soothing ambiance. With a menu that harmonizes both Puerto Rican and Southern cuisine, Torres and Hoyt take a lot of pride in the dishes they serve. While everything is made fresh, I would add that the secret ingredient is love. Take Nana’s Arroz con Pollo (chicken with rice), made with sazon roasted chicken thighs. Hoyt explains that this was the first thing that Torres’ grandmother ever fed her. It made such an impact, that she insisted that they put it on the Fork & Dagger menu. This Puerto Rican Spanish rice is served with pulled braised chicken thighs, topped with crispy chicken skin and garnished with chimichurri. The rice is infused with sazon, a spice mixture that is a staple in Spanish American homes. Homemade sofrito and saffron are incorporated into the tender and creamy white rice, giving it a red hue. This dish was truly invigorating. It was bright and vibrant, while lending a comforting appeal. The chimichurri offered a slight tang and the briny olives, in the sofrito, added pops of flavor. The star of the dish was the juicy, tender, fall-off-the-bone chicken thighs that made me want to hunker down and stay a while. A taste of New York City with the Hot Pastrami Sandwich. All breads, like this marbled rye, are ordered from a bakery in Tribeca. She cooks two shoulders at a time in the oven for a minimum of 8 hours. The shredded meat tops a bed of cheesy grits that includes everything from aged cheddar to provolone. The Pig and Grits is topped with a fried egg that has crispy golden edges and molten creamy yolk. If you have a hankering for a taste of New York City, Fork & Dagger offers classics like the Hot Pastrami Sandwich as well as Lox and Bagels. All the breads are from Tribeca, and the bagels are shipped in from a bakery in the Bronx. 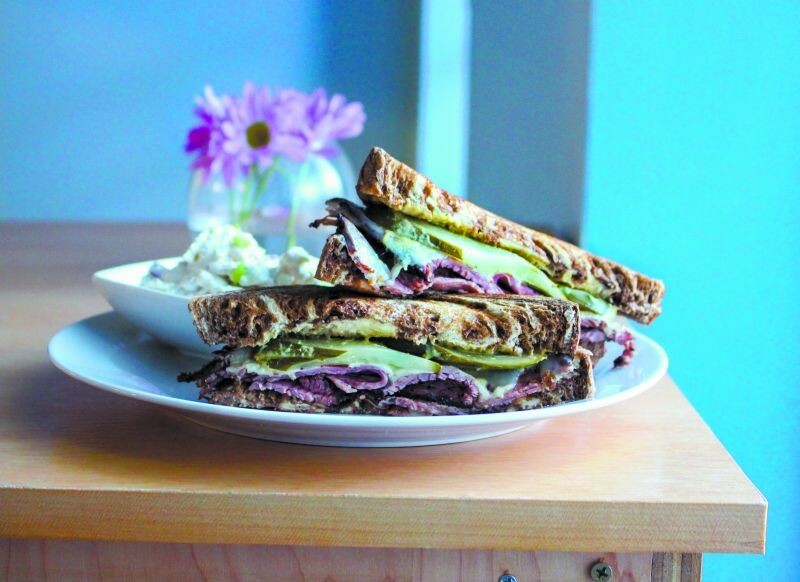 The Hot Pastrami sandwich has thick and fresh pastrami piled high on marbled rye bread. Dijon mustard, spear pickles and Swiss cheese sealed the deal. The side of house made potato salad featured Yukon Gold potatoes, eggs, bacon and onions. This lunch staple embodied the flavors and appeal of a New York style deli. Every menu item is priced to the dollar and ranges from $4 to $8. This eatery is open Mon.-Sat. 8:30 a.m.-3 p.m., leaving some time for their catering business and family time. 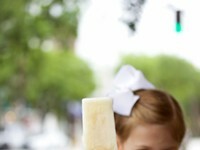 Fork & Dagger is at 609 ½ Abercorn St.